HHB have their usual stand at IBC this year in Hall 8 on Stand 8.D56 and have announced a range of new products from the brands they represent. 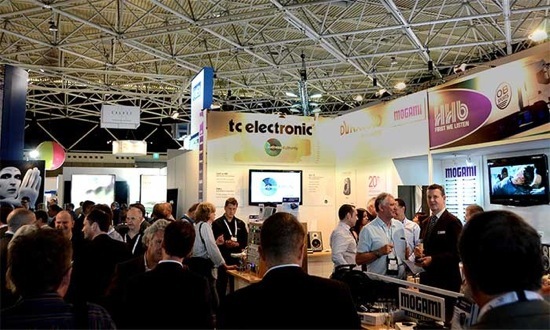 HHB Communications Ltd. is hosting the exclusive world debut of the new TC Electronic aNorm loudness algorithm and the latest products from co-exhibitors TC Electronic at IBC 2014 in Hall 8 on Stand 8.D56. TC Electronic’s aNorm normalisation algorithm provides innovative loudness adjustment features that offer a new approach for user-defined Targets for Program Loudness and Loudness Range (LRA). Complementing aNorm is the new Butterfly Processing Meter that offers both graphical and numerical displays of Program Loudness and Loudness Range parameters at all stages of the process. We are proud to offer second-generation loudness normalisation and new loudness processing metering to all audio-conscious broadcasters. aNorm adapts seamlessly to your content to achieve a transparent result where delicate production balances aren’t washed out. It is also easy to use, and it even leads to new transition processing never before possible. This new mic which is ideal for on-camera audio recording with camcorders, DSLR cameras and portable audio recorders has a 10 year warranty, and is housed in a lightweight aluminium body, SVMX maintains high levels of resistance to RF interference. SVMX’s externally-biased, condenser capsules are independently housed in integrated Rycote Lyre multi-axis shock mounts to provide ithe mics with isolation from bumps or vibration. Superior protection from wind noise, unwanted vibrations, knocks and bumps is provided via an outer dome structure that provides physical protection for the sensitive capsules. The Stereo VideoMic X will be shipping globally in October 2014. The HHB Pro Audio Report has a strong editorial focus and comprehensive content. Issue 2 is comprised of 40 pages of information on industry topics and in-depth pro audio product information for the broadcast, education, music recording, OB, post, radio, television and video game markets. UK Screen Technology Working Group Chair Neil Hatton provides an update on file delivery and loudness that focuses on the requirements of the Digital Production Partnership. Leading journalist Paul Mac explains Object-Based Audio with a look at Dolby’s Atmos system. He also contributes an article on the latest standards of digital audio networking. DiGiCo MD James Gordon offers an exclusive insight into the features and technology that have made DiGiCo broadcast consoles the top choice for this year’s Wimbledon Championships and the 2014 Commonwealth Games. It is very important that the Pro Audio Report highlights the most relevant issues and technologies for pro audio professionals. Issue 2 truly reflects the diversity of our expertise, with features and technical information that are in-depth and editorially focused. Visitors to IBC can collect a free copy of the Pro Audio report on HHB’s Stand. UK residents can register to receive a free print copy of The Pro Audio Report here. A digital edition will also be available on the HHB website.